This topic provides instructions for configuring some third-party log management services. Once you have configured a service, refer to the Third-Party Log Management Services topic for instructions on binding your app to the service. Identify the Logit ELK stack you want to use. Note your TCP-SSL, TCP, or UDP Port (not the syslog port). 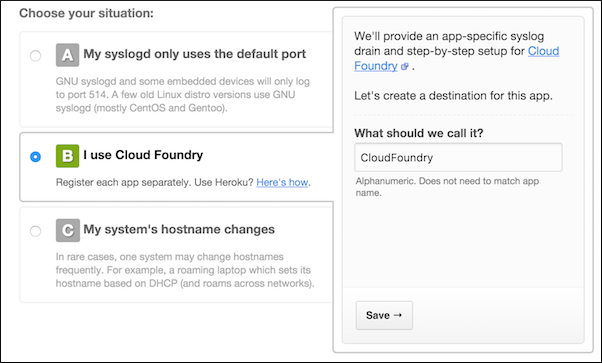 Create the log drain service in Cloud Foundry. After a short delay, logs begin to appear in Kibana. 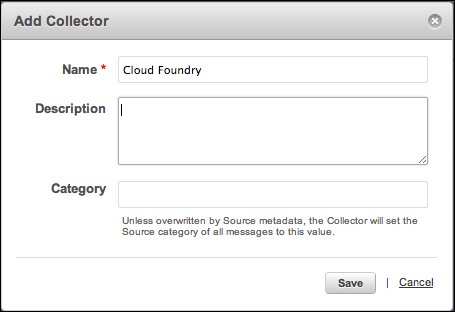 Select I use Cloud Foundry, enter a name, and click Save. Record the URL with port that is displayed after creating the system. Once Papertrail starts receiving log entries, the view automatically updates to the logs viewing page. See Streaming App Logs to Splunk for details. Create a new input for Network data. Manually enter the external IP addresses your Cloud Foundry administrator assigns to outbound traffic. Note the host and port provided for TCP input. Create the log drain service in Cloud Foundry using the displayed TCP host and port. Wait for some events to appear, then click Data Summary. Click the loggregator link to view all incoming log entries from Cloud Foundry. Note: SumoLogic uses HTTPS for communication. HTTPS is supported in Cloud Foundry v158 and later. Click the Add Collector link. Choose Hosted Collector and fill in the details. In the new collector’s row of the collectors view, click the Add Source link. Once the source is created, a URL should be displayed. You can also view the URL by clicking the Show URL link beside the created source. 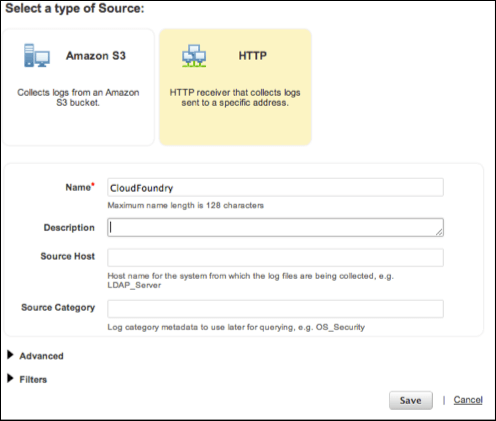 Create the log drain service in Cloud Foundry using the displayed URL. 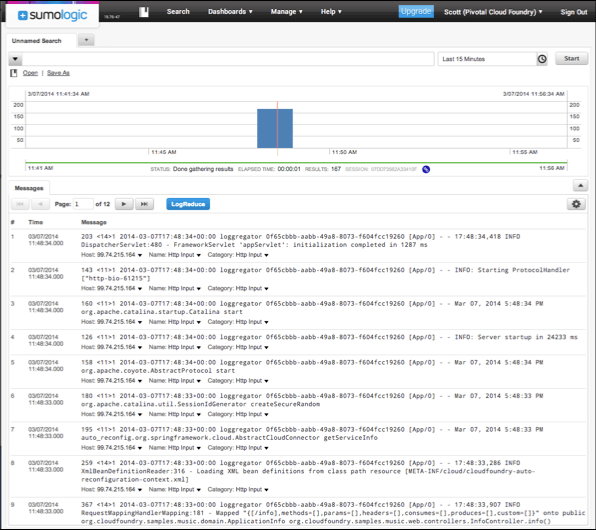 In the SumoLogic dashboard, click Manage, then click Status to see a view of log messages received over time. In the SumoLogic dashboard, click Search. Place the cursor in the search box, then press Enter to submit an empty search query. Note: Logsene uses HTTPS for communication. HTTPS is supported in Cloud Foundry v158 and later. Click the Create App / Logsene App menu item. Enter a name and click Add Application to create the Logsene App. Bind the log drain to an app. You could optionally bind multiple apps to one log drain. After a short delay, logs begin to flow automatically and appear in the Logsene UI. 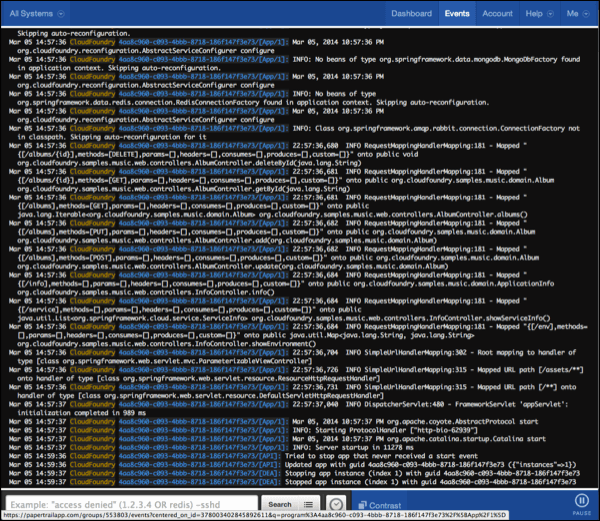 Cloud Foundry distributes log messages over multiple servers to handle load. Currently, we do not recommend using Logentries as it does not support multiple syslog sources.